Sometimes you need to have a screen with 2 grids that depend on each other. When you change line in one grid, it should refresh records in another. In this case you need to establish Grids Master-Detail relationship. Put PXDBDefault attributes in child DAC to auto-initialize dependent keys. Put PXParent attribute in child DAC to allow cascade deletion and few other functions. Use Current<> parameter in Data Views to refresh child table data based on parent record. So for grids you need to do the same points,plus some more. I’ll show it based on example of Generic Inquires. We will speak about 2 tables: GIRelation and GIOn that are Master-Detail relationship. We use PXDBDefault in GIOn DAC to auto-insert keys, so user should not wary about it in UI. We also need to use PXParent attribute to enable cascade deletion, formulas, defaulting and some other fictions. We also use Current<> parameter in the PXSelect dataview to select proper detailed records. Please note that our child table has 2 conditions as it depends on GIRelation and GIDesign (as primary entity) also. That is all from the code perspective, but we also need to configure UI to automatically refresh child grid, when we update parent. To do this we enable auto-callback from the parent grid to the child grid. This callback will be triggered on changes in parent and refresh child grid. 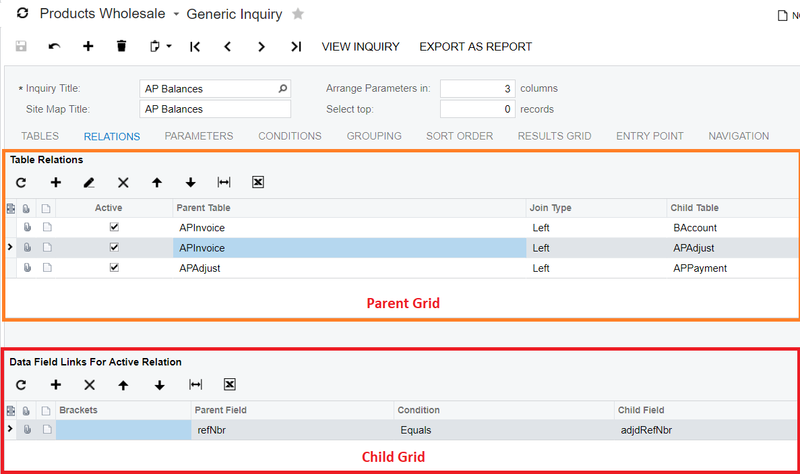 And lastly we need to advise Acumatica UI that changes (or selected recird) in the parent grid should be synced back to graph, as dataview there need to know parent for proper child select. To do that we set SyncPosition=”True” for the parent grid. That is it, now Master-Detail relationship is established and child grid should be refreshed automatically as soon as you change record in the parent grid.